Extra lives: Press [Space] to pause game play, then press [Esc]. 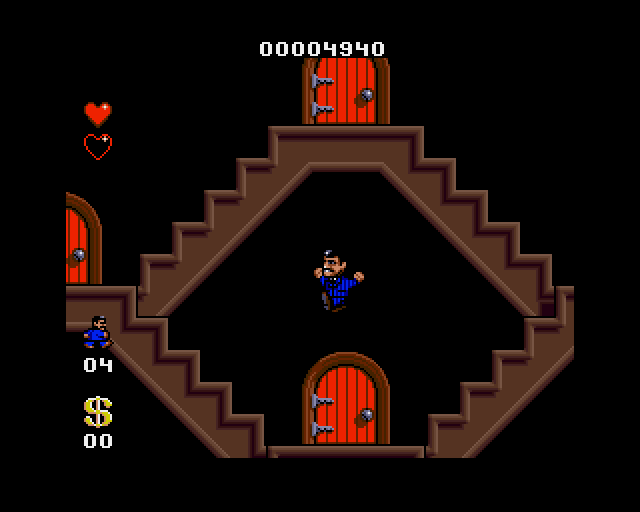 A screen with continue and escape doors will appear. Walk to the left to eventually reach a room that contains several bonus lives. Note: This may also be done when the game ends to gain four extra lives. Hint: Secret room: Walk to the left in the hall of rooms until finding a door above your character. Press Up to enter a secret room. After collecting all items, walk directly up to the door and press Up to find more objects. 100 lives: Enter 11111 as a password. 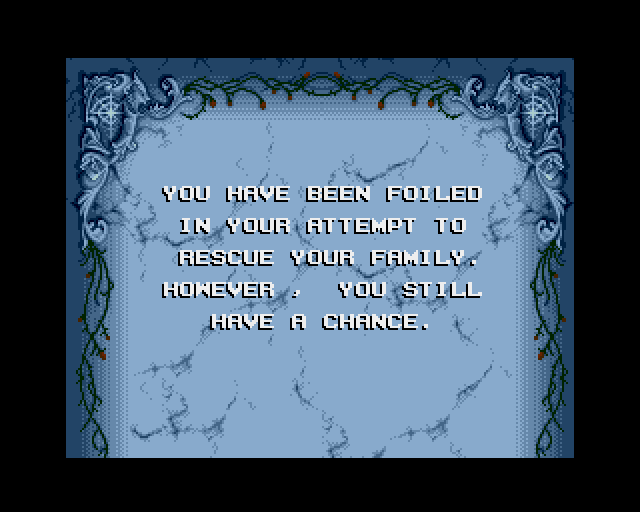 Note: This only is valid in early versions of the game. 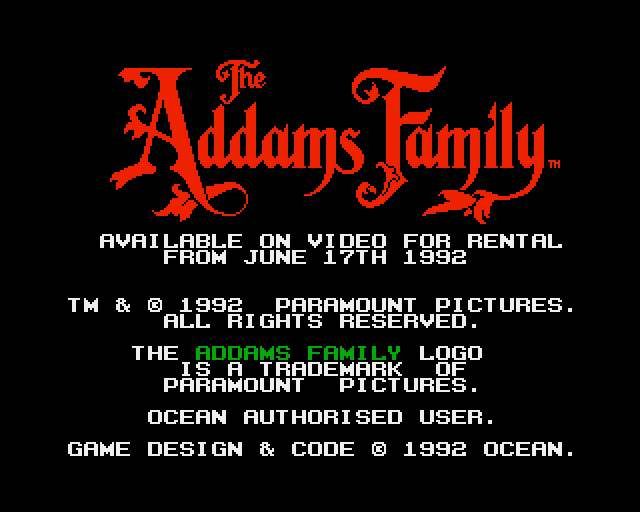 Being a big Addams Family fan, having watched all of the original B/W TV series and the more recent films, I couldn't wait to try this game based on this cult series. This platform game was released across multiple systems (SNES, Amiga, Atari ST, etc), but I assume it was actually developed on the SNES and then ported as the best version is arguable the SNES version; and after playing that version in a local store I had eagerly awaited its release on the Amiga. I wasn't disappointed either as it plays exactly the same as th SNES version. 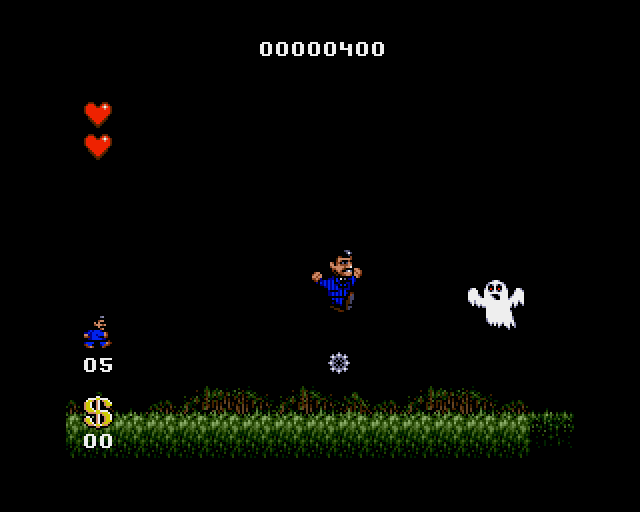 The gameplay is identical with the main character easy to control via joystick and the game scrolling smoothly. The sprites are also very nicely animated and colourfully drawn. 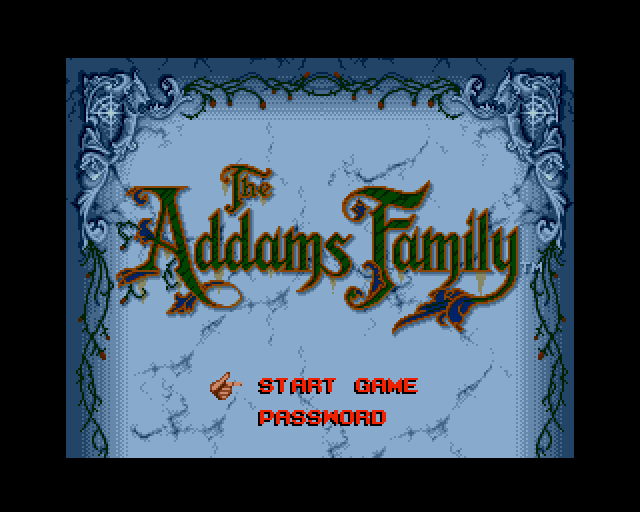 This continues with the rest of the game's graphics, which are dark in theme due to the nature of The Addam's Family, but are also colourful and cute at the same time. Combining this with The Addam's Family tune adds a bubbly and fun atmosphere when playing. The animations are also amusing and want you to keep playing. The gameplay is set to quite a hard difficulty level, with you needing to memorise each level to guarantee success. This has always been the case with many platform games so fans of this genre will not be put off by this aspect. Going back to the graphics, it looks identical to the SNES version with the exception that the parallax scrolling backgrounds are completely missing! Instead you are just left with a black background! This is odd considering all other versions of the game do have the background graphics, and this includes the technically inferior Atari ST version. I don't know for sure but I've always assumed that they decided to port the originals level and sprite graphics perfectly, retaining their full colour, and instead sacrifice the backgrounds due to the A500 only using 32 colours onscreen compared to the SNES's 256. But I don't know the reason for sure. Overall I highly recommend this game if you are a fan of platform games, and even more so if you are a fan of The Addam's Family. It's fun to play, has some great looking graphics and level design, and it lifted by the theme tune.